With 25 percent DEET formula, OFF! 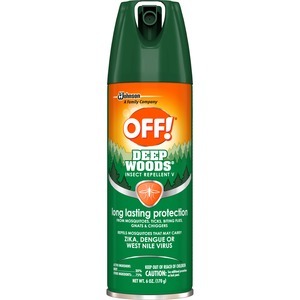 Deep Woods Insect Repellant provides up to eight hours protection from mosquitoes. Nongreasy spray-on protection resists perspiration and is ideal for use during outdoor activities. Application provides long-lasting repellency against ticks, mosquitoes, black flies, sand flies, chiggers, fleas and gnats. The special valve system allows the aerosol to be sprayed in any direction, permitting easy application to skin and clothing.